Early 2015 I somehow heard that professor H.E.S. Woldring would present his first book about Jan Amos Comenius with a lecture at the university where he used to lecture. That first book was a biography of Comenius. 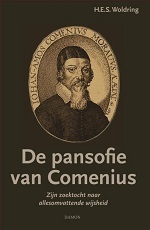 Two years later the author presents a book about Comenius’ “pansophy” as he called it himself. The book is only 200 pages and relatively expensive, but like the first book it is a good-looking hardcover. In a large number of short chapters Woldring analyses Comenius’ philosophy and how it developed. He starts with some general remarks about the man Jan Amos Comenius and about his ‘project’. Then follow, roughly chronologically, analyses about Comenius’ philosophy and the books he wrote in different periods. Woldring also uses Comenius’ own “syncritical” method on his own ideas. Especially towards the end Woldring compares Comenius to contemporaries. The last chapters are inquiries about Comenius’ “style of thinking” and then those of René Descartes and Baruch de Spinoza. “The Pansophy of Comenius” is an alright read. It is a bit of a guide through Comenius’ books and a reference work to his developing ideas, but it is probably mostly (just) an introduction to the man’s thinking. As the title suggests, the book is written in Dutch.